From Kartika Review (Issue 15, Spring 2013), we bring Christine Lee Zilka and Sunny Woan’s in-depth interview with Monique Truong- Vietnamese American fiction writer and essayist, author of The Book of Salt (2003), Bitter in the Mouth (2010), and co-editor of Watermark: Vietnamese American Poetry & Prose (1998)– which discusses how food plays a recurring theme in her books, her writing processes pertaining to physical setting and the actual physical act of writing, and her inspiration for Bitter in the Mouth. 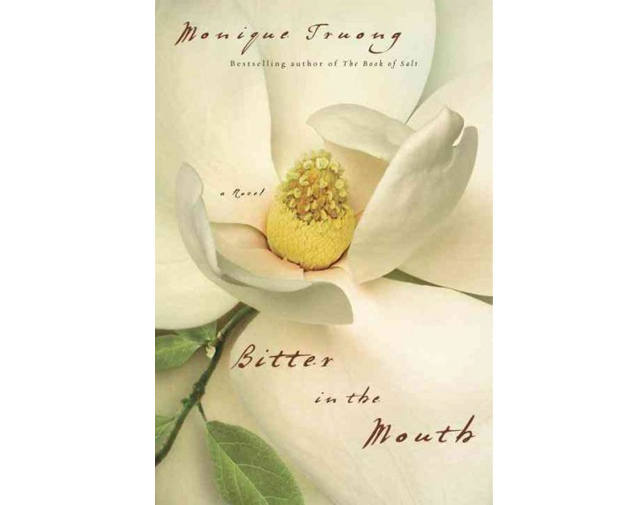 One of the most illustrious writers of contemporary Vietnamese American literature, Monique Truong inspires with her characters and her quiet, intelligent prose. 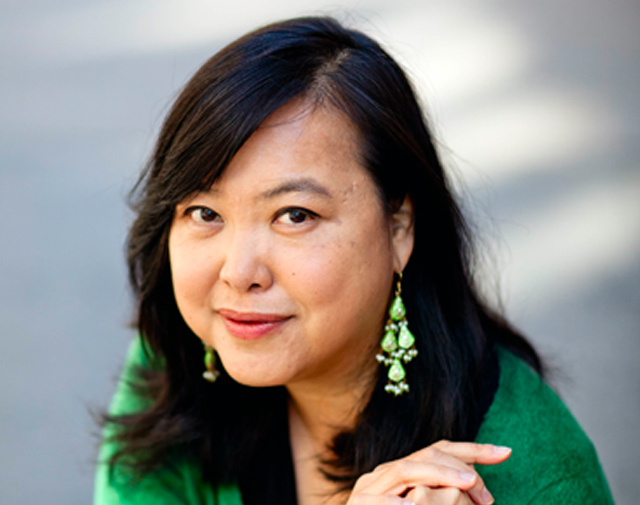 She is a former fiction editor of The Asian Pacific American Journal and co-editor of the highly acclaimed anthology Watermark: Vietnamese American Poetry & Prose. Truong was born in Saigon and came to the States as a child in 1975. She attended Yale, then Columbia Law, and then in 2003 published her debut The Book of Salt, which won numerous awards. Then, in 2010 she published her sophomore novel Bitter in the Mouth. Bitter follows a young woman, Linda, growing up in the 70’s and 80’s in Boiler Springs, a small North Carolina town. Linda experiences memory and words through taste, a condition known as synesthesia. The story is part coming of age and part tragedy as Linda explores her past and comes to revelations about her family and herself. Like Truong’s first book, The Book of Salt, a fictionalized narrative about the Vietnamese in-house cook of Gertrude Stein and Alice B. Toklas, Bitter in the Mouth is centered around food and eating. In one of our most exquisite interviews to date, the editors of Kartika converse with Monique Truong about her books and her writing rituals. Her responses, her thoughtfulness, and the astonishing beauty of her words caused us to fall even deeper in love with her work. KARTIKA REVIEW (KR): Food as theme? You have said in prior interviews that your books are not about food, and yet—yet they circle food and the sense of taste. How do you see them as not about food? KR: Writing another race is difficult—and in Book of Salt, you wrote another gender and sexuality. What challenges did you face writing a gay character? MT: My mantra while writing The Book of Salt: Love is love. Desire is desire. Sometimes the worst thing that we as writers and human beings can assume is that “other” people’s love is qualitatively different from our own and thus unknowable or inscrutable. The circumstances and the expression of that love may be different, but the love itself is not. I felt that if I was true to this, then I would be able to create a character with emotional integrity and resonance no matter the gender, sexual orientation, or historical time period. KR: I have a confession—On a rainy afternoon while at Hedgebrook, I flipped through the journals of prior occupants of Oak cottage and discovered you’d stayed in the same cottage for your writing residency. I picked up Book of Salt and began reading, and came across a passage in which you described the rain falling on the roof—and the synchronicity between the rain falling on the roof of Oak cottage at Hedgebrook and the rain falling on the roof in Paris was undeniable. Some writers say they don’t write their physical setting into the novel—others say they have to travel far away to see the places in which they’ve lived. But there—there, I saw Hedgebrook, in real time. Did you write that passage while at Hedgebrook? To what extent does your physical setting seep into your writing? I’m pretty certain that I wrote that during my first residency at Hedgebrook (for three months during the spring of 2000). I’m not sure how not to write my physical setting into my novels. The pervasive rain in Washington state was the rhythm to which I wrote many chapters of Salt, especially the ones about Binh’s mother. That’s another example of how my physical setting found its way into my narrative. Hedgebrook is a writing residency for women, and three months of talking primarily with women and hearing the stories of their lives and their mother’s and grandmother’s lives made me acutely attuned to the constraints and the acts of rebellion that were nonetheless possible for women throughout history. Of course, many of these acts of bravery and defiance were not on the public stage but within the domestic space. Binh’s mother to me became one of these rebellious women. She was brave and defiant to have loved the schoolteacher. I’m not sure if I would have written her the same way if I had been writing elsewhere. KR: Alice B. Toklas’ cookbook was the inspiration for Book of Salt—what was the inspiration for Bitter in the Mouth? MT: I saw a segment about synesthesia, a neurological condition that causes the mixing of the senses, on a television show. There was an interview with a British man who experienced tastes when he heard or said certain words. That was the seed of Bitter for me. I knew that this condition would allow me to write about food and flavors again, but from an unusual angle. KR: In Bitter in the Mouth, experience is expressed through the sense of taste. What is it about the sense of taste over the other physical senses (sight, touch, hearing, etc.) that seems to pull your writing toward it? Although for the protagonist of Bitter it is a health condition, for the reader it is a different perspective on story. What inspired you to tell that particular perspective of story? My sense of taste is my dominant sense. I favor it, and it favors me right back. I’ve an incredibly good memory for flavors and can combine them in my head and experience them in the abstract. I think many avid home cooks and chefs can do this too. My memories are also often accompanied by the clear tastes of the foods that I ate during these discreet moments in time. For example, I’ve a friend from college who introduced me to dry-cured olives. Whenever I think of her, I’m overwhelmed by the briny, faintly buttery flavor of those black olives and can see them sitting in a little dish on her table. Linda’s synesthesia is her secret sense. Secrets and hiding in plain sight are themes that are explored in many other ways in Bitter. But before all of those are revealed, I wanted to invite readers to identify with Linda. Yes, her condition is rare and unusual, but I do think it’s easy or tempting to imagine that we can understand it. The flavors that she experiences when she hears or speaks certain words are those of the American dinner table in the mid 1970s and onward. Many of these flavors are courtesy of processed, canned, and mass-marketed foods. These flavors, in reality, are common denominators. KR: One incidental theme in Bitter in the Mouth is the tension between truth and story (for example, the grandmother), objective history versus subjective. You have mentioned in prior interviews that all history (and the law as well) is story. Do you think that’s one of the rationales for choosing first person point of view in both Book of Salt and Bitter in the Mouth, your notion of the objective existing only in the subjective story? MT: I’m a firm believer that how a person tells her story is as revealing as the story itself. The first-person voice is, for me, the best way to explore all the how’s. What Linda tells you first about herself and what she withholds until later, for instance. I also prefer the first-person voice because it allows me to inhabit a character-specific vocabulary and relationship to language, which are other manifestation of subjectivity. A character can attach an unusual meaning to a commonly used word, twisting it slightly or entirely, and it’s up to me to reveal to the reader the idiosyncrasies and what they may mean. KR: What is the physical act of writing like for you? MT: I wrote both my novels at many different residencies and also in my writing room in Brooklyn. Wherever I am, I place my desk right next to a window. On the desk, I set up a simple visual tableau related to the story that I’m working on. A set of tiny silver-plated salt and pepper shakers for The Book of Salt. A ceramic ashtray in the shape of North Carolina for Bitter in the Mouth. Sometimes, I’m convinced that I have to be wearing shoes or I can’t write. I try not to write while wearing my PJs and never just my underwear (sorry, over sharing). This is all certainly related to my need to escape the house or building (and my manuscript) in an emergency. I’m not joking. Feeling in control and prepared is necessary for my process, especially since what’s happening on the page/screen is so often the opposite of that. I believe strongly in the ritual as opposed to the routine of writing. Ritual and routine are not the same. Ritual (a long walk beforehand, a cup of roasted rice tea during, an salutary nod to my literary heroes, Gertrude Stein and Marguerite Yourcenar, whose works in various forms occupy a place of honor on my writing desk right now) is about the physical, intellectual and emotional transition that needs to take place before I can shed my day-to-day self and become my writing self. Routine is the numbing repetition of an act: laptop, daily word count, and deadlines. KR: Stories versus novels: with which do you feel more comfortable, and why? MT: I love the short story, but I haven’t written a short story in decades. In my novels, I’m always hoping to achieve the emotional economy, tautness of language, and gestural symbolism that are present in the best of them. KR: In what way/s has your law background informed your fiction? MT: The law taught me precision. Find and use the word that means exactly what you want to convey. Do not compromise or there will be ugly consequences. KR: What advice do you have for beginning or emerging writers? MT: I recommend that they travel, not just while they are emerging but during the whole of their writerly lives. I also recommend that they take off their headphones or ear buds when on the subway, bus, train, etc. In other words, eavesdrop. Everyday people say amazing and odd things. The other day I walked by a group of older African-American men on Sixth Avenue, and one of them was adamantly repeating this phrase several times: “God and Hilary Clinton…” I should have stopped and listened to the denouement, but I was in a hurry. That too: Don’t be in a hurry. You end up missing things. Please take the time to rate this post (above) and share it (below). Ratings for top posts are listed on the sidebar. Sharing (on email, Facebook, etc.) helps spread the word about diaCRITICS, and join the conversation and leave a comment! What processes do you have for your own writing? Do you have your own ritual? How does your physical surrounding play into your writing? We’d really like to know so tell us!